(1) We are looking for a second author to write the Case of the Week discussions, so we can get ahead by several weeks, and are covered when one author goes on leave or has a busy period. You must be a staff pathologist and a good writer. The advantages are getting known by the 6300+ subscribers to this feature, as well as $75 per case discussion. The initial time commitment is 2-3 hours per week. When we are caught up, it will be less. If interested, contact Dr. Pernick at NatPernick@gmail.com, and attach your CV and a writing sample. (2) Welcome Dr. Maria Tretiakova, Associate Professor of Pathology at the University of Washington, to our Editorial Board. Her area of focus is GU, specifically Kidney, Bladder and Testis. See our Authors page for more information about our Editors and Authors. (3) We have now updated our Top Books page to include the top 14 books purchased from Amazon.com through PathologyOutlines.com for the first quarter of 2016, in alphabetical order. The top 5 books are listed here. 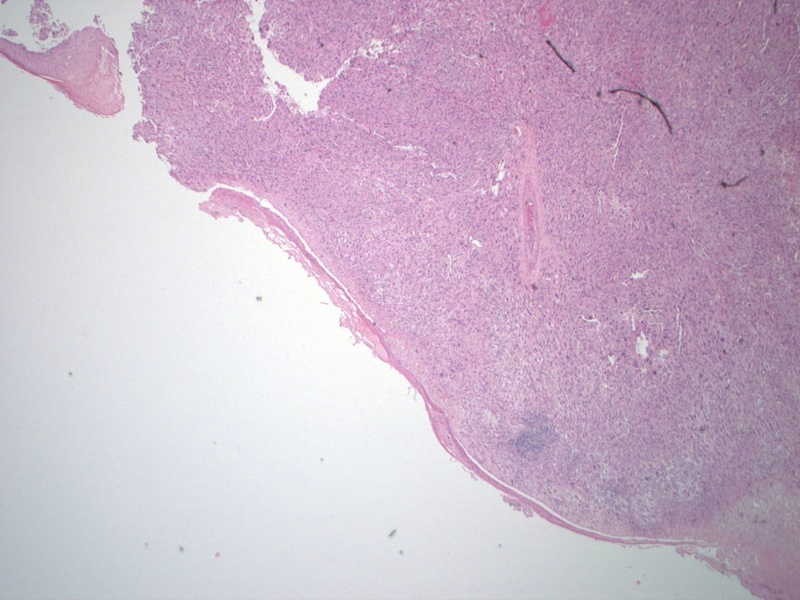 A 67 year old man presented with a scalp nodule, 1.5 cm in diameter, which was excised. 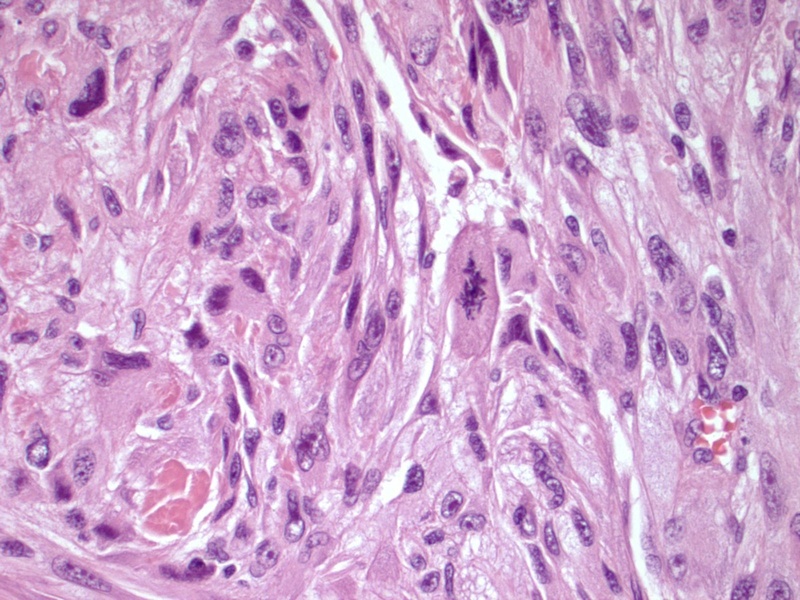 Histology shows a subepidermal malignant cellular neoplasm composed of spindle cells arranged in sweeping fascicles intersecting at right angles and causing a storiform pattern. 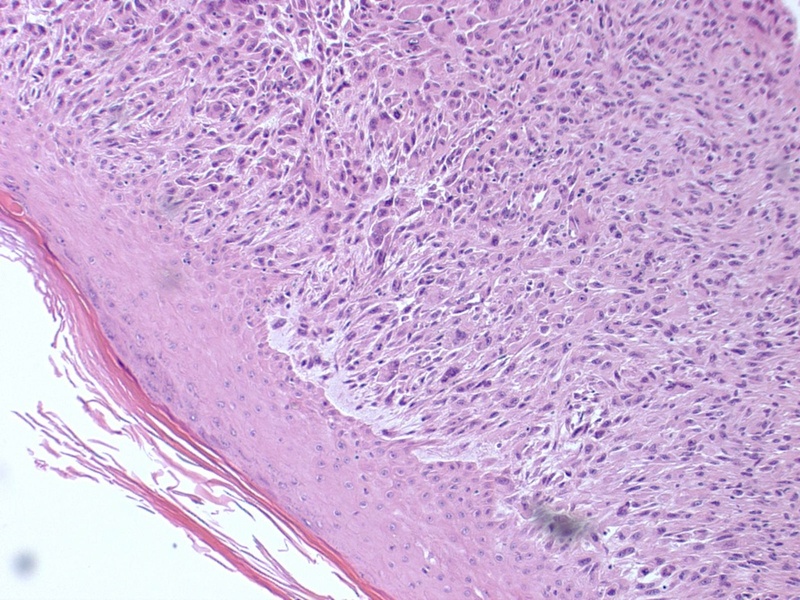 Most cells have ample eosinophilic cytoplasm, while some show cytoplasmic vacuolation. 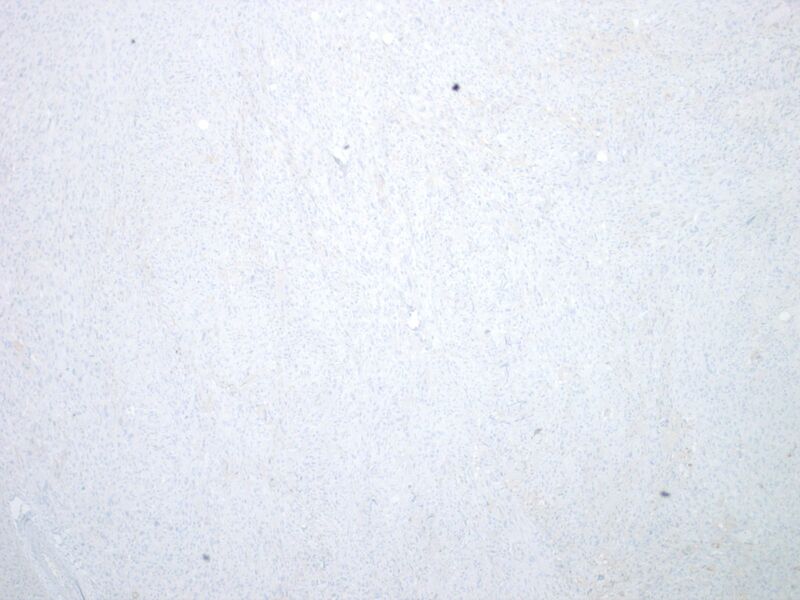 The nuclei are enlarged and elongate with irregular nuclear membranes, vesicular chromatin and prominent nucleoli. 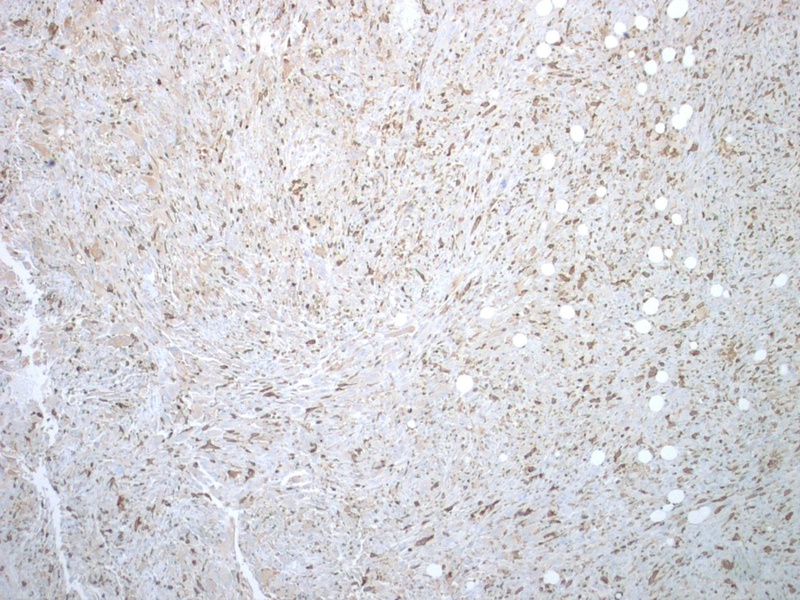 The background shows several pleomorphic and irregular large sized cells which are multinucleate and multilobated; some Touton-type giant cells are also present. 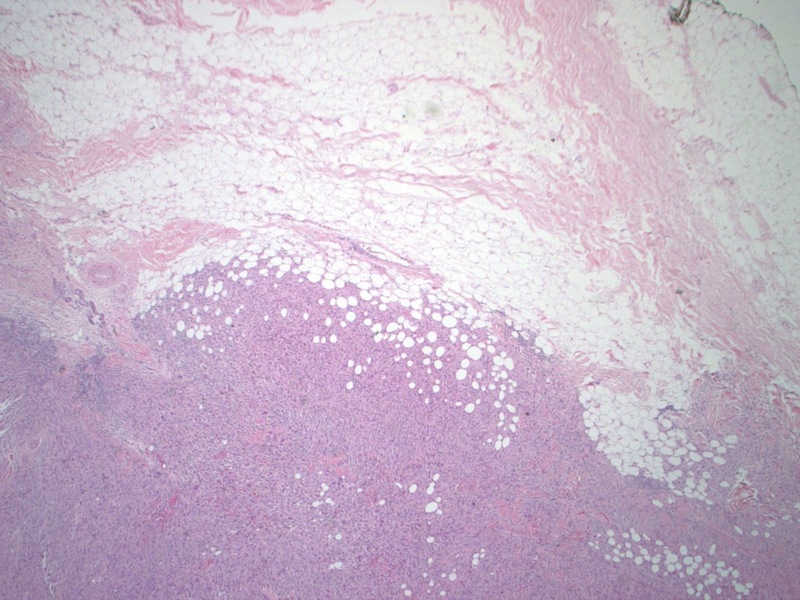 Atypical mitotic activity is frequently identified. The neoplastic cells infiltrate the underlying subcutaneous fat. 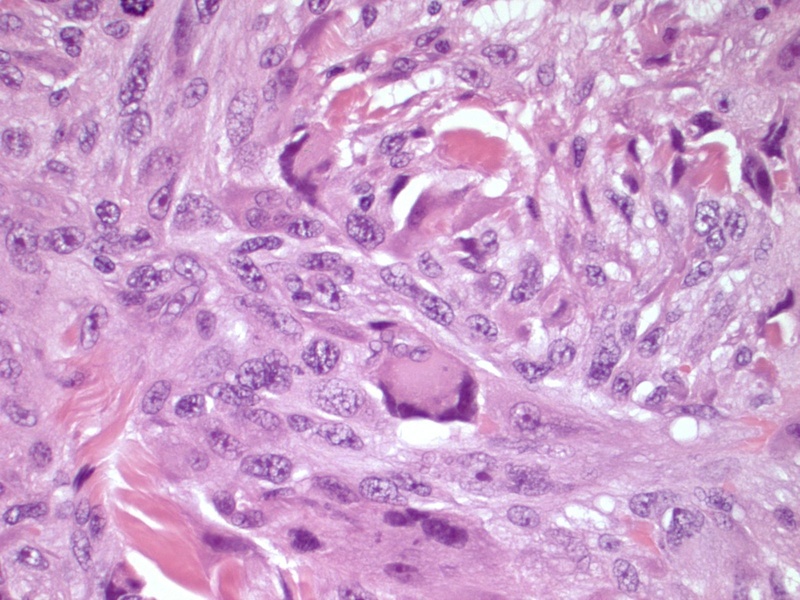 Focal areas of tumor necrosis are present. 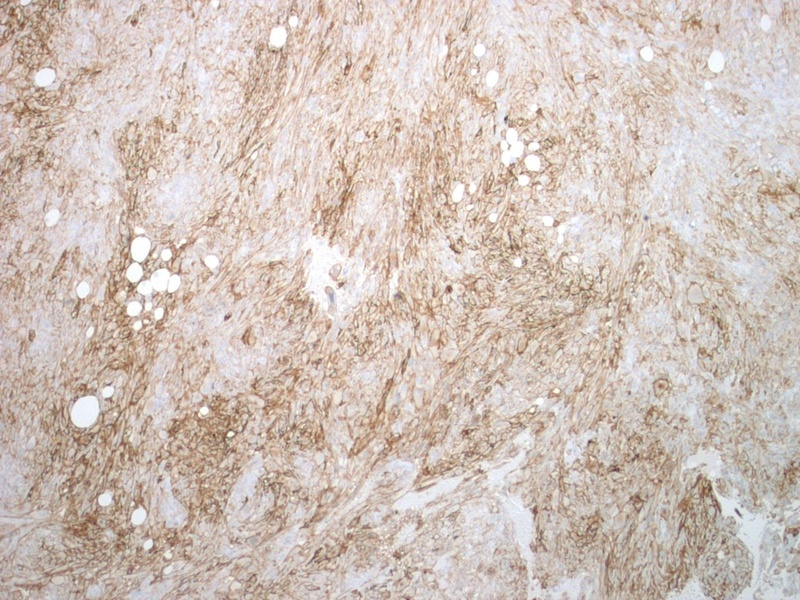 Immunohistochemistry: The neoplastic cells show diffuse and strong immunoreactivity for vimentin, and most are also positive for CD68 and CD10. 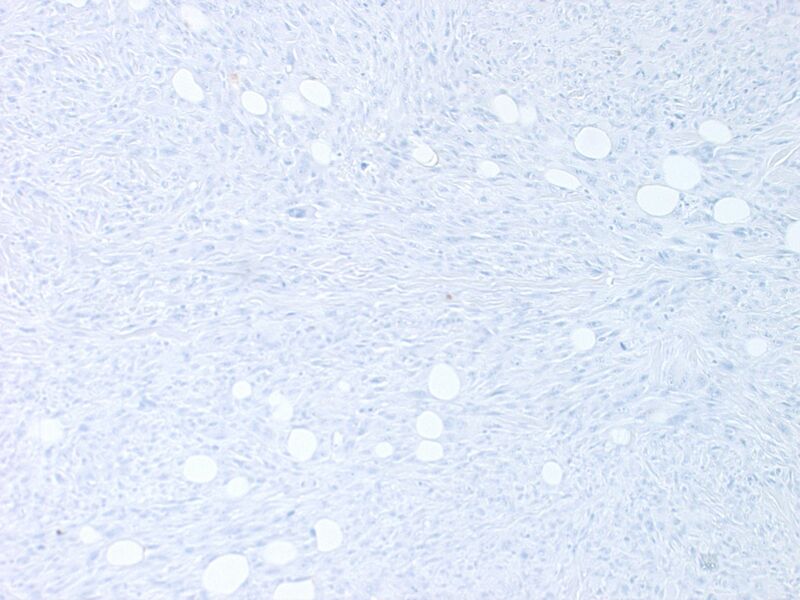 The neoplastic cells do not stain for high molecular weight (HMW) cytokeratin, cytokeratin AE1/AE3, cytokeratin CAM 5.2, HMB45, desmin, CK5/6, smooth muscle actin, CD34, CD31 or S100 protein. 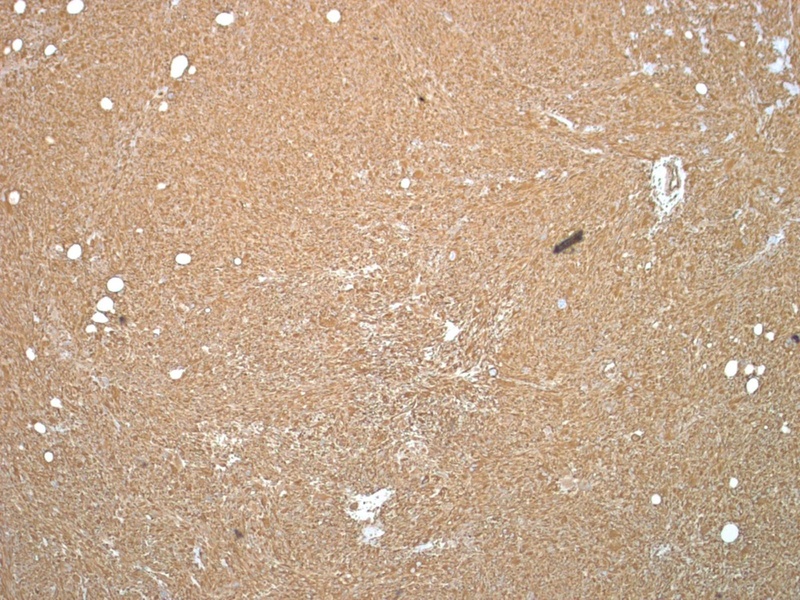 The morphologic findings and immunophenotype resemble atypical fibroxanthoma (AFX); however, because the tumor infiltrated into subcutaneous fat and demonstrated necrosis, it was classified as superficial undifferentiated pleomorphic sarcoma (UPS). 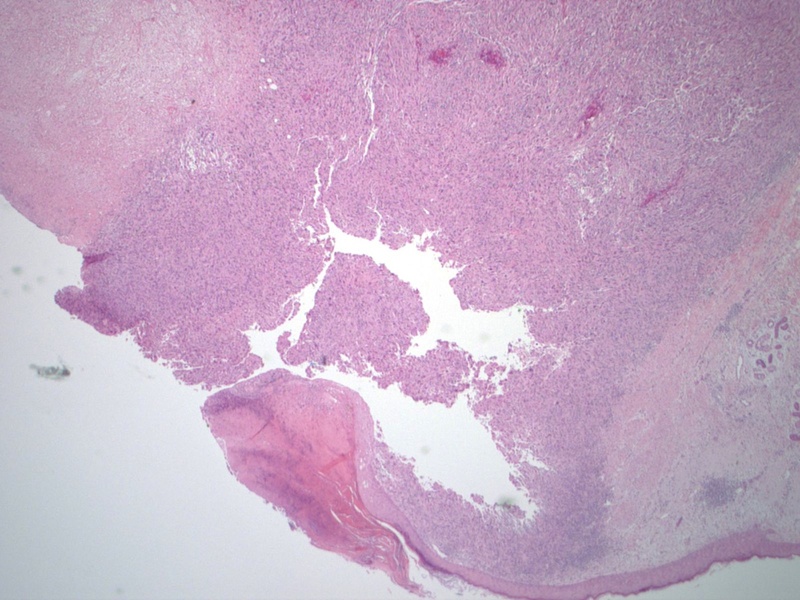 The diagnosis of AFX implies a biologically innocuous lesion, and must be distinguished from more aggressive lesions such as superficial UPS, which may recur and has metastatic potential. 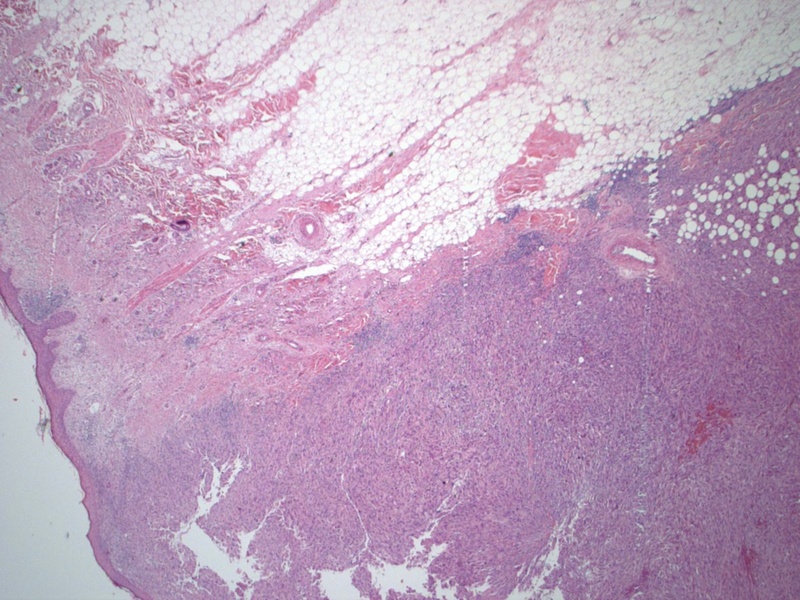 Findings that favor the latter diagnosis include size greater than 2 cm, extension into the subcutis, penetration of the fascia or muscle, areas of necrosis or vascular invasion. 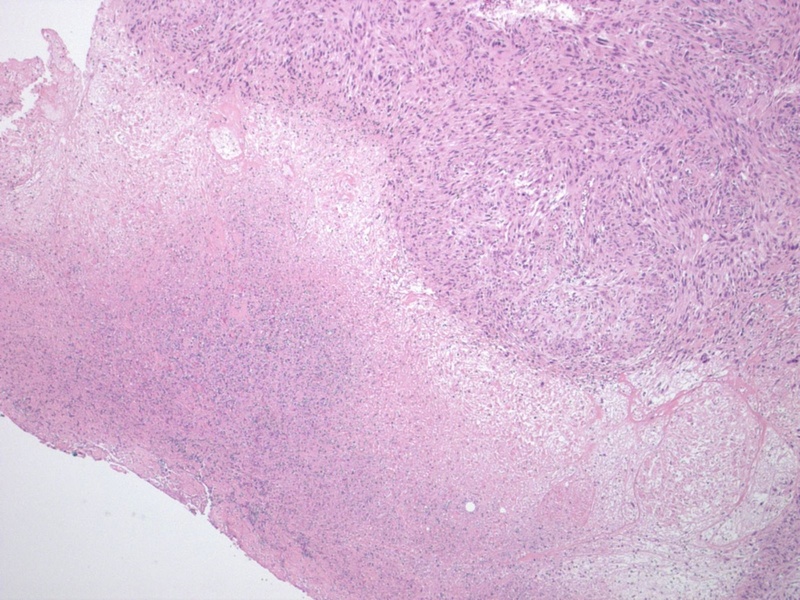 Undifferentiated pleomorphic sarcoma is a diagnosis of exclusion, whose frequency has decreased as these tumors are reclassified as liposarcoma, leiomyosarcoma or fibrosarcoma based on immunohistochemical or molecular studies (Cancers (Basel) 2013;5:218, Am J Surg Pathol 2014;38:293). These lesions are commonly diagnosed in sun damaged, actinic skin of the elderly. Generally, they present as a solitary nodule or ulcer less than 2 cm in diameter. Clinical differential diagnoses include basal cell carcinoma or squamous cell carcinoma, pyogenic granuloma, epidermal inclusion cyst, melanoma and other deeply invasive sarcomas. The histologic distinction from these entities is typically not difficult. 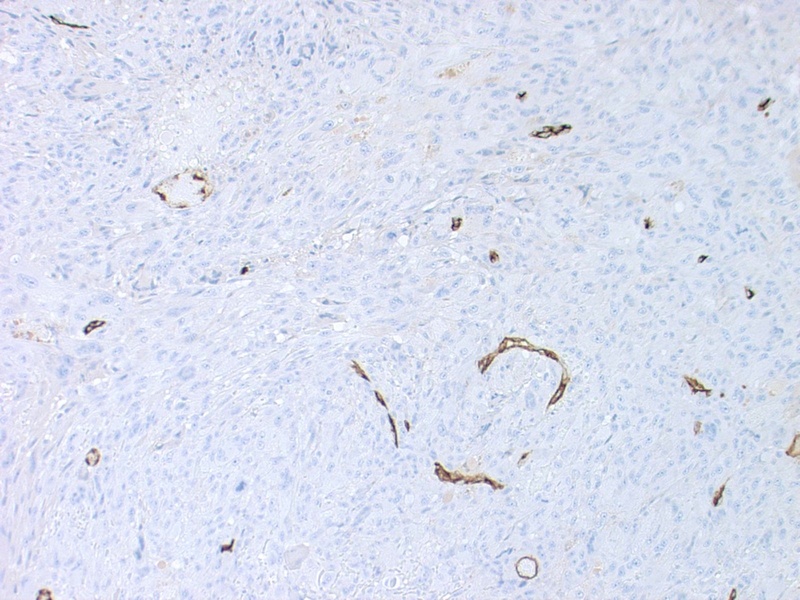 There are no specific immunomarkers for this entity; most immunohistochemical studies are employed to rule out carcinoma, melanoma and sarcoma. 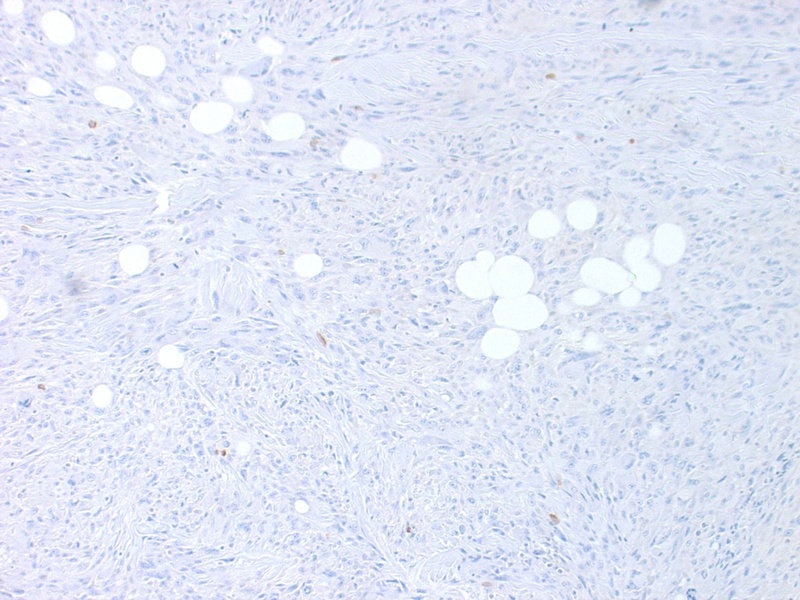 A recent study found PRDM10 fusions present in around 5% of UPS, associated with low grade lesions with better prognosis (Clin Cancer Res 2015;21:864).